Let's make succulents! Come join us at Happily Ever Etched as we teach a step by step class on making the perfect succulent that will never need to be watered and lives forever! We will also show you different ways to incorporate them into your wedding, events, and your home. We will be supplying all the materials, which include, card stock paper, scissors, glue, mini pot, moss, and a packet of paper to take home for practice. Let's make flowers! Come join us with Faithful Artisans as we teach a step by step class on how to make paper flowers with regular card stock paper perfect for spring. We also want an opportunity to get to know everyone and hangout so we will also take a field trip to Pie Hole after the class. 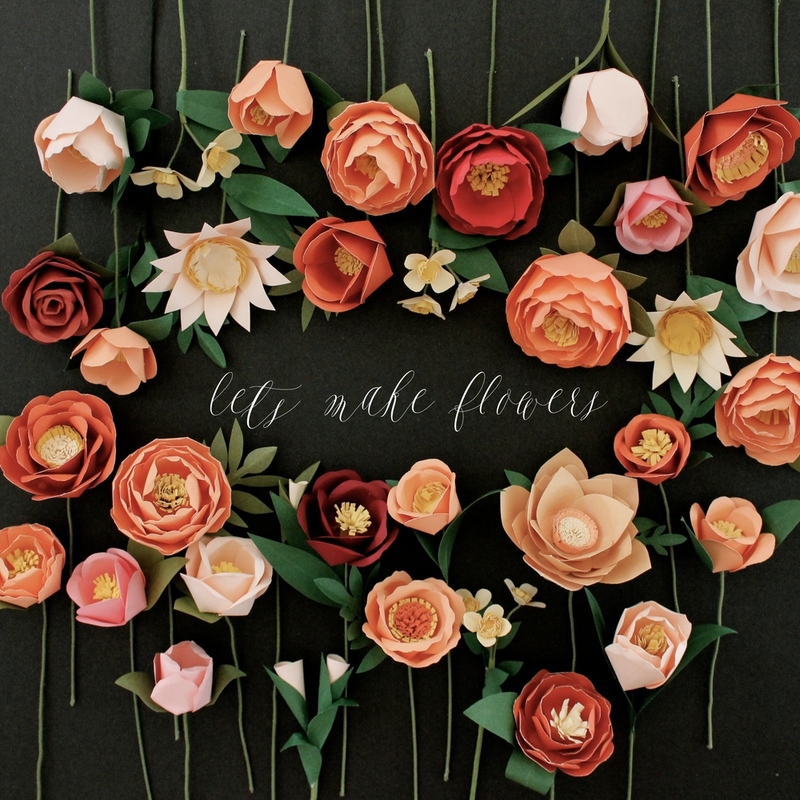 During the workshop we will be showing you how to make different types of paper flowers along with different ways to incorporate them into your wedding, events, and your home! We will be supplying all the materials, which include, card stock paper, scissors, glue, and a packet of paper to take home for practice. Come join us at Smitten on Paper's adorable shop to learn how to make paper succulents and pot them together. We will be doing a step by step class on making the perfect succulent that will never need to be watered and lives forever! We will also show you different ways to incorporate them into your wedding, events, and your home. We will be supplying all the materials, which include, card stock paper, scissors, glue, mini pot, moss, and a packet of paper to take home for practice. Join us at Oh, Hello Friend Studio in Fullerton, CA for a festive craft night and make handmade holiday paper flowers that can be great gifts for family and friends for the season. We will be showing you how to make different types of paper flowers along with different ways to incorporate them into your wedding, events, and your home! We will be supplying all the materials, which include, card stock paper, scissors, glue, and a packet of paper to take home for practice. Learn how to make paper succulents and pot them with us. We will be doing a step by step class on making the perfect succulent that will never need to be watered and lives forever! We will also show you different ways to incorporate them into your wedding, events, and your home. We will be supplying all the materials, which include, card stock paper, scissors, glue, mini pot, moss, and a packet of paper to take home for practice. Come join us at Morning Lavender's pop up party along with Katie B Cosmetics for a fabulous day of beauty, shopping and mimosas! We will be joining them at Twenty Eight Restaurant and having a trunk show with all our original Handmade By Sara Kim accessories and paper flower bouquets where you could shop and ask us questions directly. Come join us as we teach a step by step class on how to make giant paper flowers with regular card stock paper. We will be showing you how to make the different sizes up to 15 inches wide, along with different ways to incorporate them into your wedding, events and your home. We will be supplying all the materials, which include, card stock paper, scissors, glue, and a packet of paper to take home for practice. Whether you're engaged or just a lover of entertaining, we invite you to come get inspired by some of the most uniquely talented wedding vendors in Los Angeles at West Elm LA! Join us for a morning of pretty flowers, unique DIY details, photobooth fun, coffee & gourmet bites. Couples can also sign up for their dream wedding registry and partner with our West Elm experts in store. We will have a trunk show of our original Handmadebysarakim pieces where you could shop and ask us questions directly. This is a complimentary event but RSVP is required below. We look forward to seeing you there. Discover amazing wedding vendors in Southern California at the Carmel Mountain Country Club Bridal Open House. We will have a trunk show of our original Handmadebysarakim pieces where you could shop and ask us questions directly. There will be a tour of the beautiful venue with hors d'oeuvres and refreshments. The open house is complimentary but RSVP is required. Please sign up below for FREE or it will be $5 at the door. We look forward to seeing you there. Learn how to make paper succulents and pot them with us like you see in the image. We will be doing a step by step class on making the perfect succulent that you will never need to water. Our class will be held at The Warehouse in Brea, CA home to SomethingBorrowedSomethingVintage Wedding Rentals. It will be Friday October 17th from 6-9pm, all materials are provided as well as some sweets. So come and join us for a beautifully handmade event surrounded by a curated collection of vintage furniture and props!